One journaling exercise that I like is to create a list of 100. I always start excited to list out 100 things of whatever, only to struggle to complete it. Today was no different as I did a list of 100 things to be thankful for. It’s been a good year and I’d like to remember that in the future. I listed all kinds of things, from family and friends, to my pets and possessions. I like my house and books! The great things about these lists is looking at them later, adding what I missed, and enjoying my life as it was at that moment in time. Oh give thanks unto the Lord, for He is good and His mercy endures forever. 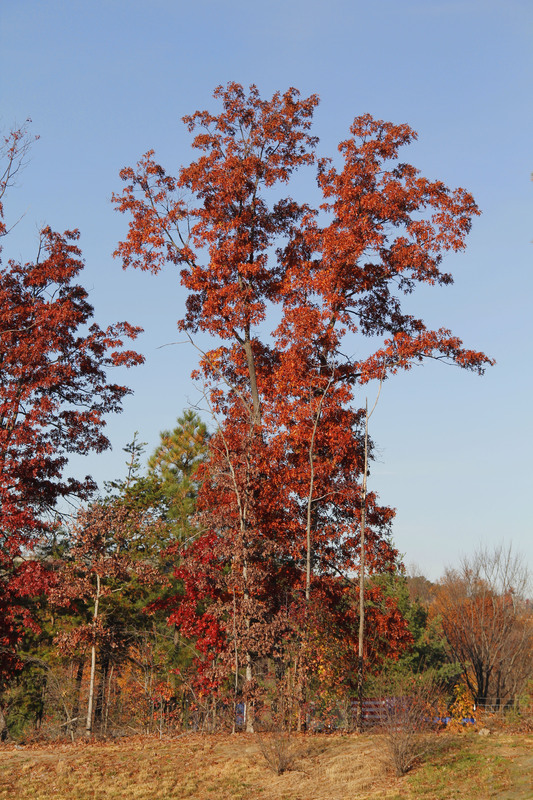 This bright red tree was at the edge of the parking lot of one of our favorite breakfast stops, Cracker Barrel. Word for tomorrow – BLOGGER’S CHOICE. If you prefer to work ahead, see the list for the week under “A Word A Day”. We all have so much to be thankful for. That is a lovely tree, I like that fiery red. It was way overdue for me to write up 100 things to be thankful for – I am truly blessed of God. I’m glad you liked the photo. Believe it or not, I took it at the end of the parking lot at Cracker Barrel here in town. I couldn’t resist – it was so pretty. Nice list! You have a great point of view! And thanks for visiting today.